Please note for 2014 we are taking a break and will be re-organising for 2015 with an exciting itinerary. Many apologies to our regular customers and send our best wishes to you all. GEOFF KERSEY, CAROL HILL, TIM ROSE, RICHARD HOLLAND AND THE UK SCHOOL OF FRAMING WILL STILL BE USING US AS THEIR VENUE. 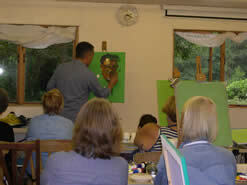 For more information on the format of our art courses holidays please see examples of our previous 2013 art courses courses & prices tab above. Situated over the picturesque Lea Brook, our purpose-built art studio is a welcoming heated space equiped with fridge and drinks tray as well as a selection of tables, stand-up easels and backing boards. 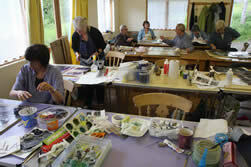 The studio can accommodate up to 15 students with a screen and projector to aid detailed tutor demonstrations. 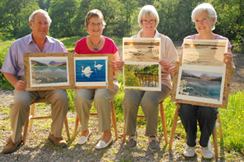 Our waterside studio provides the ideal indoor venue for our art courses (unless out on location) and can be hired separately by art clubs or groups wishing to arrange their own special breaks. Course tuition runs from 9:30 to 4:30pm each day, unless otherwise stated, with scheduled lunch, morning coffee and afternoon tea breaks. Students may choose to enrol as either day attendance or residential students and we offer two prices to reflect this. Residential students can enjoy a relaxing and comfortable on-site stay in our four-star Pear Tree Farm Guest House. Please view the "Guest House and B&B Section" tab above to view interior photographs. If you require one of our two ground floor rooms, please let us know at the time of booking. Our residential prices are based on single occupancy of a double room. Our residential option provides full board, including breakfast and evening meal as well as buffet or packed lunch (depending on course programme). Unless otherwise stated, residential students arrive on the afternoon prior to the start of the course for evening meal and group introduction. Day attendance students arrive daily at 9:15 to allow for a prompt studio start. Our day attendance students enjoy a buffet or packed lunch (depending on course programme) which allows the whole group time to socialise together. One of the most common enquires art students have when booking an art course is- 'what shall I bring'? On booking students will recieve pre-course information and materials lists detailing a list of paints, brushes, paper and mics. items to consider. Unless stated students should bring their own painting materials, brushes and papers/boards. We are always on hand to offer advice if unsure and recommend that beginner students telephone prior to buying an extensive set of paints and equipment! We are happy to accommodate a friend/partner who is not studying on a course. If they share a room with you, they will be charged our standard B&B/evening meal rate of £55 per night. 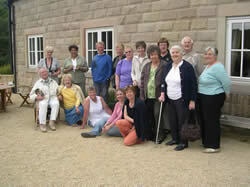 Non-painting partners will find many activities and interests in the surrounding area. We are located on the boundary of the Peak District National Park which is famous amongst walkers, cyclists, climbers and cavers for both beautiful and challenging scenery. Looking for an unsual and personalised present for that special artist in your life? 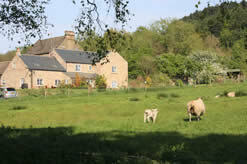 What better way to delight them than with an individual Derbyshire Arts and Pear Tree Farm Gift Voucher. For more information please contact us today.